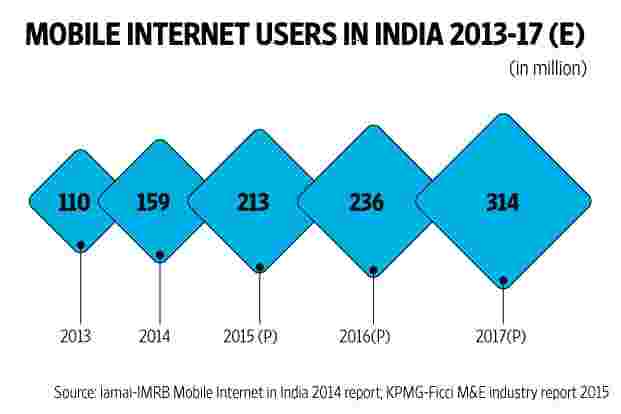 New Delhi: The number of mobile Internet users in India is projected to double and cross the 300 million mark by 2017 from 159 million users at present, a new report by Internet and Mobile Association of India (IAMAI) and consultancy firm KPMG said on Monday. 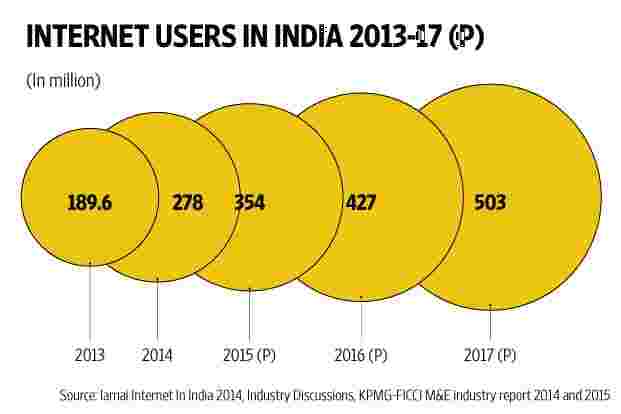 “The number of mobile Internet users in India is expected to grow to 314 million by the end of 2017 with a CAGR (compounded annual growth rate) of around 28% for the period 2013- 2017," according to the report authored by Akhilesh Tuteja, partner and head of the technology vertical, and Ashvin Vellody, partner, management consulting, at KPMG. 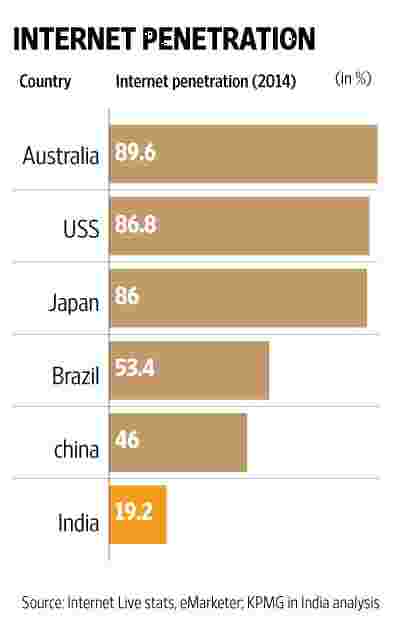 “This impressive growth would drive India to become one of the leading Internet markets in the world with more than 50% of Internet user base being mobile-only Internet users." Digital India is an umbrella programme that encompasses providing Internet access to all by creating infrastructure, delivering government services on the Web and mobile phone, promoting digital literacy and increasing electronic manufacturing capability. In the 2014-15 Union budget, the government committed ₹ 500 crore for building infrastructure, as per the National Rural Internet and Technology Mission, with an additional ₹ 100 crore for improving e-governance with the aim to increase tele-density in rural areas. “Meaningful and compelling content can be an important driver for enabling adoption of mobile Internet. 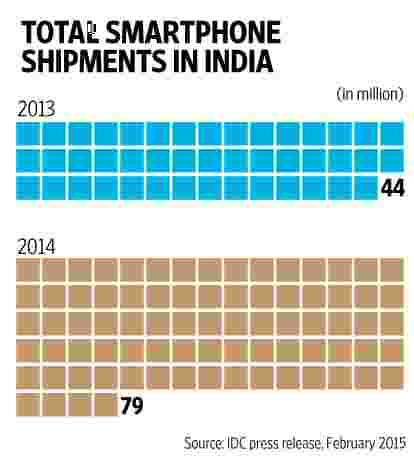 Traditional services like voice, SMS are gradually being replaced by mobile data services," said the report. 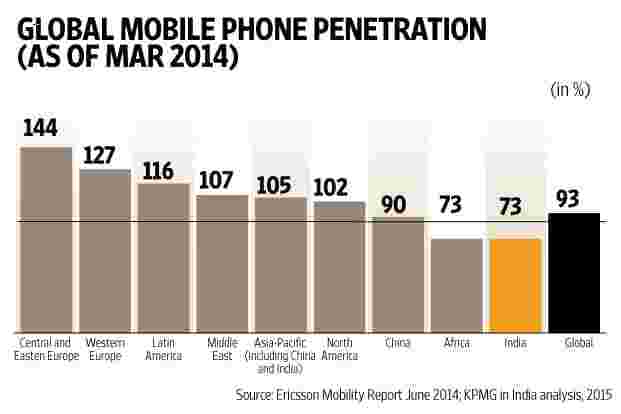 “Indian mobile content usage is dominated by email, social networking, chat, games and news. 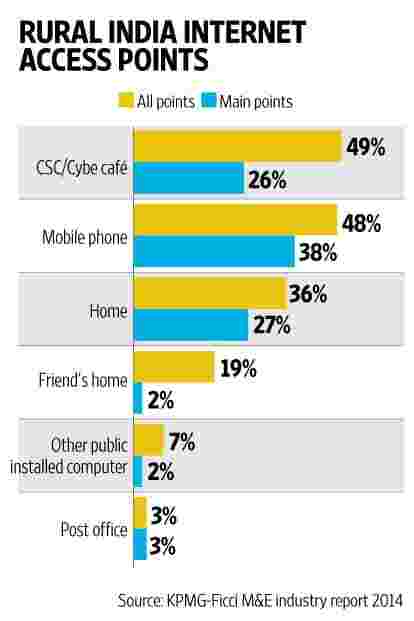 While these categories gained popularity because they fulfil multiple needs of consumers, the positive social and economic impact of the Internet is probably manifold," said the report. The report said mobile phones were being touted as one of the greatest mediums of change—like giving people without a bank account access to financial services and providing health services in rural areas. 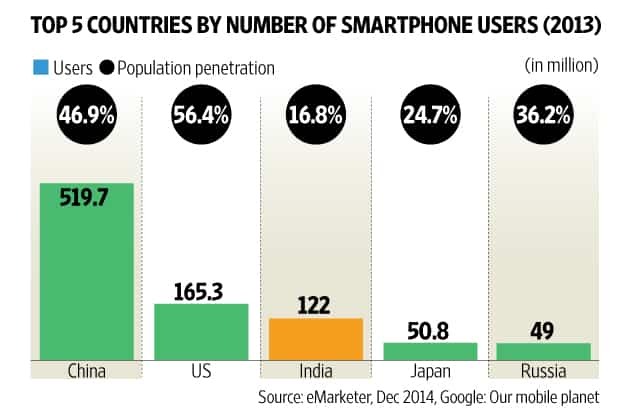 “The mobile data services would help to tackle key issues plaguing education, health, finance, agriculture and governance in India," it said. What perhaps worsens the situation is “limited collaboration between the different pillars of the ecosystem; each component is trying to take the challenges of demand, supply and customer satisfaction head-on by itself", the report said.